1Institute of Medical Molecular Biotechnology (IMMB), Faculty of Medicine, Universiti Teknologi MARA (UiTM), Sg Buloh Campus, 47000 Sg Buloh, Selangor Darul Ehsan, Malaysia. 2Maternofetal and Embryo (MatE) Research Group, Health and Wellbeing CoRe, Universiti Teknologi MARA (UiTM), 40450 Shah Alam, Selangor Darul Ehsan, Malaysia. 3Faculty of Medicine, Universiti Teknologi MARA (UiTM), Sg Buloh Campus, 47000 Sg Buloh, Selangor Darul Ehsan, Malaysia. 4Faculty of Health Sciences, Universiti Teknologi MARA (UiTM), Puncak Alam Campus, 423000 Bandar Puncak Alam, Selangor Darul Ehsan, Malaysia. Embryo culture is a vital procedure in Assisted Reproductive Technologies (ART). Assessment of embryonic morphology and development is of importance in the selection of embryos for transfer. Survivability of embryos in culture media depends on nutrient supply to maintain embryonic growth at every stage of preimplantation development. The objective of this study was to observe the effect of M16, HTF and KSOM commercial media on preimplantation embryonic development and morphological grading. Female mice were superovulated with pregnant mare’s serum gonadotropin (PMSG) followed by human chorionic gonadotropin (hCG) 48 h later. The oviducts were flushed at 23 -25 h post-hCG using M2 medium. Embryos with two pro-nuclei were selected for culture. A total of 240 embryos were equally divided for culture in M16, HTF and KSOM media. Embryonic development and morphological grading were observed at 48, 67, 74, 93 and 11 h post-hCG until the hatched blastocyst stage. Significantly higher numbers of blastocysts was observed in HTF and KSOM cultures at 93 h post-hCG, compared to M16 culture (p<0.05). HTF showed a significantly higher number of Grade B4 blastocyst (p<0.05), while KSOM showed a significantly higher number of Grade B1 blastocysts (p<0.05), compared to M16. Morphological quality appeared to be stage dependant. M16 medium showed significantly higher number of 8-cell stage (n=62) compared to HTF (p= 0.026). Our observations suggested that for ICR mouse embryos, M16 is effective in promoting precompaction stage development until the 8-cell stage, while HTF and KSOM were more effective in promoting post-compaction stage development, hence producing more blastocysts. Murine embryo, embryo culture, development, culture medium. In vitro fertilization (IVF) and culture (IVC) have been performed in murine models to study the physiology and molecular events of reproductive and developmental processes. Murine embryos are commonly used to study and monitor culture conditions, techniques and instrumentation used in human IVF due to similarities in their nutritional requirements and developmental milestones with human embryos. The optimal conditions of IVC on mouse embryos depend on a number of parameters. The composition of the culture medium used is an important determinant [1,2]. Optimization of IVC is considered a fundamental requirement in ART in order to maintain embryo viability before transfer. Assessment of embryonic development is a useful platform to select the most viable embryos for transfer. However, the survivability of embryos in culture media depends on several factors, including sufficient nutrient supply to maintain the growth of embryos at every stage of development. Various studies have been conducted to evaluate culture systems with respect to developmental competence and embryo grading in human [3, 4] and mice [5,6]. Preimplantation stages of murine embryonic development are normally characterized by morphology of the developing cells and specific alteration in gene transcription, followed by messenger ribonucleic acid (mRNA) and protein synthesis . The primary goal in culturing preimplantation embryos is to allow growth of embryos in artificial environment in order to assist in the development of embryos. Media such as M16, HTF and KSOM used in this study contain similar metabolites, such as glucose, phosphate, magnesium sulphate, glutamine, pyruvate and EDTA constituent differences, as shown in Table 1. Table 1: General components of M16, HTF and KSOM. M16 medium is known as a conventional culture medium and has been used in the routine culture of mouse embryos. It is a modified Krebs-Ringer bicarbonate solution and is very similar to Whitten’s medium . In 1956, Whitten  found that by adding glucose to this medium mouse embryos developed to the 8-cell stage. Previous studies by Whitten , Brinster et al. . and Biggers et al. . showed that the addition of several other metabolites into the culture medium was essential. Lactate allowed embryos to grow from 2-cell to the blastocyst stage in the presence of glucose, while pyruvate supported the transition from 1- to 2-cell [9-11]. Another study showed that the utilization of glucose was low at the beginning of embryonic development; however, it increased during compaction and blastocyst stages . This provided evidence that pyruvate and lactate support early mouse development, whereas glucose supports development of embryos at the post-compaction stages. Kalium (K+) Simplex Optimized Medium (KSOM) medium was developed after the M16 medium. It was modified from Simplex Optimized Medium (SOM), which was originally developed to overcome the 2-cell block in CF1 mouse zygotes . The addition of K+ allowed CF1 zygotes to develop into blastocysts . The concentrations of NaCl and KCl were also increased in KSOM [15,14]. KSOM was optimized using all 9 components found in M16 medium, plus glutamine and in EDTA . The addition of the nonessential amino acid, glutamine into KSOM was found to stimulate the development of 8-cell hamster embryos to the blastocyst stage . Thus, glutamine could be metabolized by embryos and stimulate the embryonic development. The addition of Eagle’s non-essential amino acids and glutamine was found to significantly improve development to the blastocyst stage and increase the rate of compaction [17,18]. Addition of ethylenediaminetetraacetic acid (EDTA) into the culture media blocked the process of glycolysis, which prevented glucose utilization in early cleavage embryos . Human tubal fluid (HTF) medium consists of balanced salt solutions with added carbohydrates, glucose, pyruvate and lactate. This medium is based on similar concentration of potassium in the reproductive tract . HTF however, does not contain EDTA as a chelating agent to inhibit glycolysis. Presently, studies that compare the effects of various commercially available culture media on the development of preimplantation mouse embryos are still lacking. Therefore, the purpose of this study was to determine the effects of embryo culture in M16, HTF, and KSOM media on pre-implantation development till the blastocyst stage, as well as morphological quality at different stages of preimplantation development. The development of preimplantation embryos was assessed by the formation of blastocysts, hatching of blastocysts, and morphological grading of blastomeres, as well as appearance of cytoplasmic fragments. Information obtained from this study would contribute towards the understanding of preimplantation embryonic requirement subjected to in vitro culture. All procedures on the animals were approved by UiTM Animal Care & Use Committee (Approval code ACUC- 7/11). Twenty three (8 to 10 week-old) female ICR mice weighing 35-40 g were used as embryo donors. Mice were kept at temperatures within 22+2°C, with a light/dark cycle of 12:12 h. Animals were provided food pellets and reverse osmosis water ad libitum. For superovulation, the female mice were given 10 IU of pregnant mare serum gonadotrophin (PMSG), followed by 10 IU human chorionic gonadotropin (hCG) intraperitoneally, 48 h apart. Females were then cohabited with fertile ICR males at a ratio of 1:1. Pregnabt/plugged embryo donors were euthanized at 23-25 hrs post-HCG, by cervical dislocation, for the collection of embryos. Fallopian tubes were excised and embryos were flushed using M2 medium, under a dissecting microscope (Leica Zoom 2000, Japan). Only 2 pronuclear- stage (2PN) embryos were selected for subsequent IVC. A total of 240 embryos were randomly divided into 3 groups of 80 embryos each and were subjected to IVC in M16, HTF or KSOM media. Embryos were cultured in a 35-mm culture dish (Nunclon, Roskilde, Denmark) filled with 100 μl media of either M16 (Catalogue no: M7292, Sigma-Aldrich, USA), HTF (Catalogue no: 90125, Irvine- Scientific, USA) or KSOM (Catalogue no: MR-107-D, Merck Millipore, Germany) supplemented with 5% BSA, overlaid with mineral oil (Catalogue no: M5310, Sigma- Aldrich, USA). The cultures were maintained in a humidified carbon dioxide incubator containing 5% CO2 and 95% air at 37°C for 5 consecutive days. Embryos were observed under the reverse phase light microscope (Leica IRB, Japan), and inverted microscope (Olympus 1X81 SF-3, Japan) for morphological grading, as well as developmental observation. Morphological grading was scored based on the appearance of the cells, rate of growth and degree of fragmentation at various time points (Table 2) after hCG administration. Morphological grading for 2-cell, 8-cell and 16- cell was done based on scores by Veeck  (Table 3). For the blastocyst stage, scoring was performed based on Gardner et al. (Table 4). Table 2: Observation at specific time points during preimplantation development. Table 3: Scoring criteria for cleavage stage embryos by Veeck (20). Table 4: Morphological scoring for blastocysts (21). Embryonic development was also observed according to the time points described in Table 2. Each time point represented a different stage of preimplantation development i.e. 2-cell (48 h), 8-cell (67 h), 16-cell (74 h) and blastocyst stage (93 h). The number of hatching blastocysts at 117 h (Day 5) of IVC was recorded. Data were analyzed using the SPSS package program (SPSS 20.0, Chicago, IL, USA). Statistical analysis was performed using one-way ANOVA. A p value of <0.05 was considered statistically significant. The development of preimplantation embryos in HTF KSOM and M16 media were recorded at 48, 67, 74, 93 and 117 h. Statistical analysis of development in HTF vs KSOM showed no significant differences at all observational time points (Figure 1). Figure 2 shows that the number of embryos that developed into blastocyst (93 h post-hCG) and hatched blastocysts was significantly higher in HTF, compared to in M16 medium (p = 0.016). Figure 3 showed that in KSOM compared to M16, there were significantly higher number of 8-cell embryos (KSOM vs M16) (p = 0.014), blastocyst (KSOM vs M16) (p = 0.030) and hatching blastocyst (KSOM vs M16) (p < 0.008). However, the number of embryos that cleaved into 2-cells at 48 h in M16 vs KSOM were not significantly different. Morphological Grading of Pre-implantation Embryos in M16, HTF and KSOM media: This second part of the study compared morphological grading of embryos cultured in HTF, KSOM and M16 media. 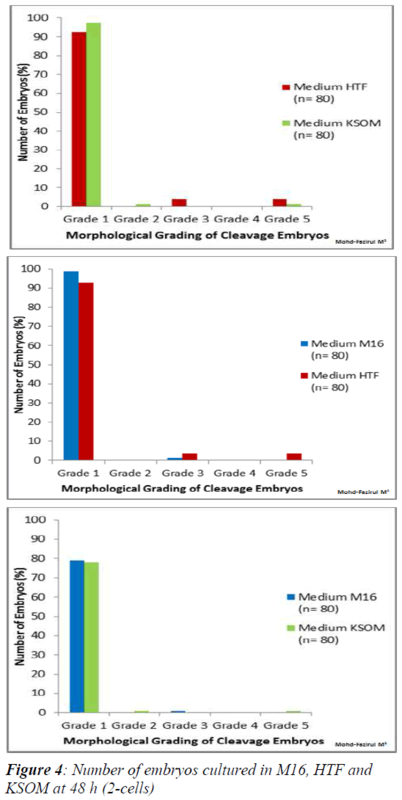 At 48 h post-hCG where cleavage-stage scoring was performed, significantly more Grade 1 embryos compared to other grades were seen in all three media (Figure 4). There were however, no significant differences in embryo morphology between media. At 67 h, results showed differences in the morphological grading of Grades 1, 2 and 5 (Figure 5). There were significantly more Grade 2 embryos observed in KSOM than in HTF (p = 0.002). At the morula stage, M16 medium appeared to be superior, and produced significantly higher numbers of Grade 1 and 2 embryos compared to HTF (p = 0.026 and 0.023, respectively). HTF produced significantly more embryos in Grade 5 compared to M16. In vitro culture at 74 h only showed a significant difference between the number of Grade 5 embryos in HTF and M16 (Figure 6). HTF was seen to produce a significantly higher number of Grade 5 embryos (p = 0.023). At 93 h, when blastocyst grading was performed, HTF showed the highest number of Grade B4 blastocysts (p = 0.007) when compared to M16 and KSOM (Figure 7). KSOM however, produced significantly higher number of Grade B1 blastocysts (p = 0.030) compared to M16 and HTF. Figure 8 shows that both HTF and KSOM produced significantly higher (p < 0.05) numbers of hatching blastocysts compared to M16. The results indicated that both HTF and KSOM were able to maintain high embryonic viability towards the end of the preimplantation stage, resulting in higher numbers of blastocyst hatching. Figure 8: Number of hatching blastocysts in M16, KSOM and HTF media. 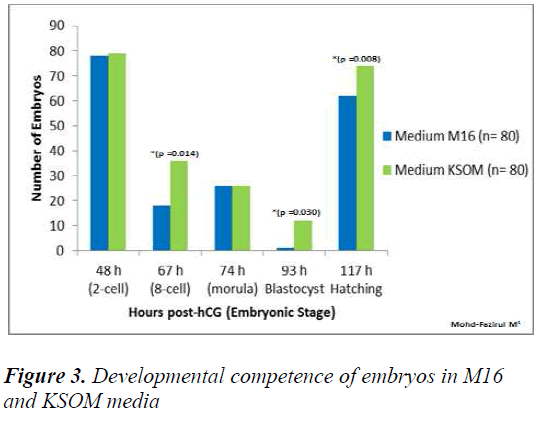 The present study demonstrated that HTF and KSOM media were superior compared to M16 medium in supporting the development of preimplantation embryos at the higher rates (>90%), up to the hatching blastocyst stage (Figure 8). Improved development to the blastocyst stage might be due to the lowering of glucose and phosphate to more optimum levels in the media. Due to higher energy requirement in the post-compaction stage glucose consumption increased to support blastocyst development (22-24). Studies carried out on glucose and pyruvate consumption and lactate production in single human embryos showed that more lactate was produced than could be accounted by glucose uptake (25, 26), suggesting that the remaining was derived from endogenous sources, such as glycogen. EDTA also prevented premature activation of glucose metabolism in 2-cell embryos [11,19]. At the pre-compaction stages, the use of M16 medium appeared to be beneficial for development and produced embryos with better morphology, with the highest number of Grade 1 embryos compared to HTF and KSOM. Various studies have been conducted to evaluate culture systems with respect to developmental competence and embryo grading in human [3,4] and mice [5,6]. In this study, KSOM produced the highest percentage of hatching blastocysts (92.5%), followed by HTF medium (91.3%). Although there were no significant differences between KSOM and HTF, the number of hatching blastocyst was significantly different in both KSOM vs M16 (p = 0.008) and HTF vs M16 (p = 0.007). 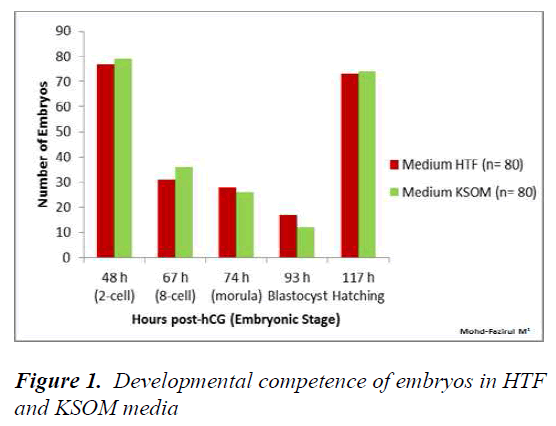 Both KSOM and HTF media appeared to provide better support for embryonic development and blastocyst differentiation until hatching. This could be due to the lower osmolarities of KSOM (255 mOsM) and HTF (284 mOsM) compared to M16 (290 mOsM). Media with lower osmolality were reported to allow embryos to complete in vitro development better than medium with higher osmolality . Although not addressed in this study, other variations in culture parameters such as type of culture overlay, oxygen and glucose tension, culture drop volume and BSA supplement might also affect the embryonic morphogenesis and developmental competence . When comparing cleavage and blastocyst grading, it was shown that blastocyst morphological grading would provide higher predictive values for implantation [29,30]. Within the first 48 h (2-cell), the number of 2-PN embryos that divided into 2-cells was not significantly different between all three media (Figures 1- 3). This suggested that KSOM, HTF and M16 media adequately provided appropriate ratios of energy sources in the form of pyruvate the first zygotic cleavage (Figure 1). At 67 h post-hCG, our study showed significantly higher number of 8-cell in KSOM compared to M16 (p = 0.014). The poorer development in M16 could be attributed differences in lactate and glucose content, with KSOM. Both of these components were required in development from 8-cell to blastocyst stage. Conaghan et al. showed that the presence of glucose was necessary for human embryos after the 8- cell stage. Consumption of glucose was minimal (8 pmol/embryo/hour) in the first 48 h but increased significantly (p < 0.001) after the fourth (20 pmol/embryo/ hour) and fifth culture days (34 pmol/ embryo/ hour). Another study on murine embryos showed that better results were obtained on development when glucose was added into the medium after embryonic genome activation . Meanwhile, at 74 h post hCG, there were no significant differences in the developmental competence of embryos between all media (Figures 1, 2 and 3). Each medium appeared to provide sufficient nutrient uptake during this stage of embryonic development. In contrast, results at 93 h showed that significantly higher numbers of blastocysts developed in HTF and KSOM, compared to M16. With reference to embryonic developmental competence, our findings showed that HTF and KSOM produced almost similar results. Embry Embryonic development in the two media was significantly better than in M16 medium. 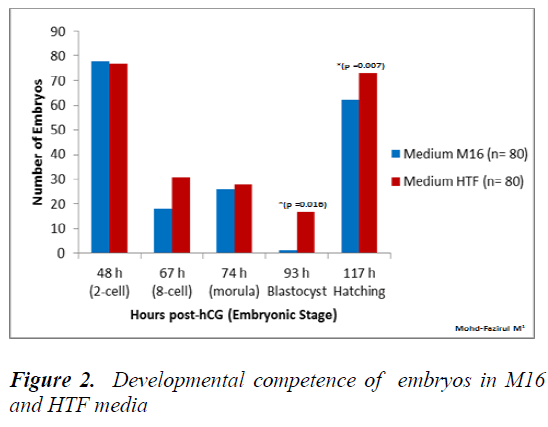 Although a comparison between HTF and M16 medium did not show a difference in early preimplantation embryonic development, there was a marked increase in development at the blastocyst stage in HTF medium (Figure 8). 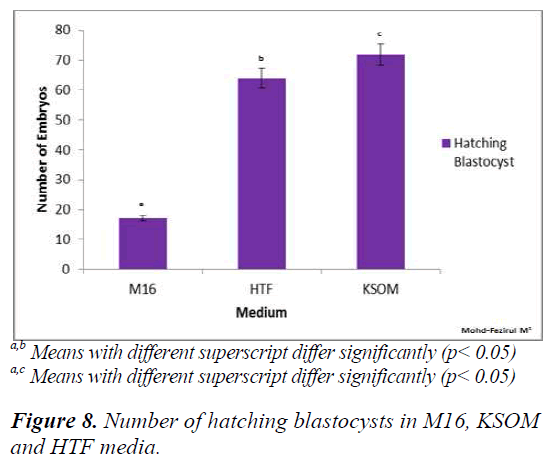 HTF and KSOM appeared to be superior to M16 with respect to the number of hatched blastocysts produced. Along the same line, HTF and KSOM were found to have significantly better morphological grading at the blastocyst stage, compared to M16. In conclusion, our results showed that M16, HTF and KSOM could support the development of ICR murine embryos at all stages, from the 2 PN zygote to the blastocyst stage. 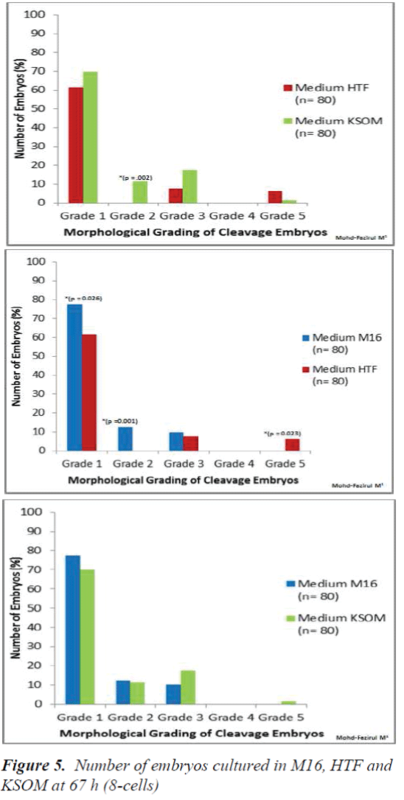 Based on morphological grading and development, M16 was found to be better for cleavage stage culture while HTF and KSOM supported better development to the blastocyst stage. Suzuki O, Asano T, Yamamoto Y, et al. Development invitro of preimplantation embryos from 55 mouse strains. ReprodFertil 1996; 8: 975-980. Menezo Y. Mouse and bovine models for human IVF. ReprodBioMed Online 2002; 4: 170-175. Quinn P, Kerin J F,Warnes G M. Improved pregnancy rate in human in vitro fertilization with the use of a medium based on the composition of human tubal fluid. FertilSteril 1985; 44: 493-498. Cossiello A, Aggelis D, Faúndeset al. Morphological differences in human zygotes and embryos cultured in different media. Zygote 2012; 20: 399- 405. Farha Naomi, Marcela V. Optimal in vitro Culture Conditions for Sustainable Development of PreimplantationMouse Embryos during Prolonged Culture. Health Environ J 2010; Vol.1, No.2. Dai S, Xu C, Wang J, et al. Effect of culture medium volume and embryo density on early mouse embryonic development: tracking the development of the individual embryo. J Assist Reprod Genetics 2012; 29: 617-623. Keith E. Latham and DavorSolter. Effect of egg composition on the developmental capacity of androgenetic mouse embryos. Development 1991;113: 561-568. Whitten WK. Nutrient requirements for the culture of preimplantation mouse embryo in vitro. AdvBiosci1971; 6: 129-139. Whitten, W.K. Culture of tubal ova. Nature 1957; 179: 1081-1082. Brinster, R L. Studies on the development of mouse embryos in vitro. The effect of energy source J ExpZool 1965; 158: 59-68. J D Biggers, D G Whittingham and R P Donahue. The pattern of energy metabolism in the mouse oocyte and zygote. Zoology 1967; 58: 2: 560-567. Leese, H J and Barton, A M. Pyruvate and glucose uptake by mouse ova and preimplantation embryos. Reprod Fert 1984; 72: 9-13. Lawitts J, Biggers J. Joint effects of sodium chloride, glutamine, and glucose in mouse preimplantation embryo culture media. MolReprodDev 1992; 31:189-194. Erbach GT, LawittsJA, Papaioannou VE, Biggers JD. Differential growth of the mouse preimplantation embryo in chemically defined media. BiolReprod 1994;50: 1027-1033. Lawitts JA, Biggers JD. Culture of preimplantation embryos.In: Wassarman PM, Depamphilis ML (eds). Guide to Techniques in Mouse Development. Methods Enzymol 1993; 225:153-164. Carney, E.W. and BavisterB.D. Stimulatory and inhibitory effects of amino acids on the development of hamster eight-cell embryos in vitro. J. In Vitro Fertil. Embryo Transfer 1987;4:1 62-167. Gardner D, Lane M. Alleviation of the 2-cell block and development to the blastocyst of CF1 mouse embryos: role of amino acids, EDTA and physical parameters. Hum Reprod 1996; 11: 2703-2712. Lane M, Gardner D. Differential regulation of mouse embryo development and viability by amino acids. J ReprodFertil 1997; 109: 153-64. Lane M and Gardner DK. Inhibiting 3-phosphoglycerate kinase by EDTA stimulates the development of the cleavage stage mouse embryo. MolReprodDev 2001; 60: 233-240. Veeck LL. Preembryo grading and degree of cytoplasmicfragmentation. In: An Atlas of Human Gametes and Conceptuses: An Illustrated Reference for Assisted Reproductive Technology. New York, USA: Parthenon Publishing 1999; pp. 46-51. Gardner D, Lane M. Embryo culture system. In: Trounson A, Gardner D, eds. Handbook of in vitro fertilization. Boca Raton, FL: CRC Press 1999; pp. 205-64. Hardy, K. Development of human blastocysts in vitro. In: Bavister, B. (ed.) Preimplantation Embryo Development. Springer Verlag, New York 1993; pp. 184-199. Johnson, M.D., Batey, D.W., Behr, B. et al. Gebetic expression of hexokinase and glucose phosphate isomerase in late-stage mouse embryo: transcription activities in glucose/ phosphate- containing HTF and glucose/phosphate fee P1 media. Mol. Hum. Reprod 1997; 3: 351-357. Gardner DK. Changes in requirements and utilization of nutrients during mammalian preimplantation embryo development and their significance in embryo culture. Theriogenology 1998; 49: 83-102. Gott, A.L., Hardy, K., Winston, R.M.L. and Leese, H.J. Non-invasive measurement of pyruvate and glucose uptake and lactate production by single human preimplantationembryos. Hum. Reprod 1990; 5: 104-108. Lane M, Gardner DK. Lactate regulates oyruvate uptake and metabolism in the preimplantation mouse embryo. BiolReprod. 2000; 62: 1: 16-22. TiminHadi, Mary-Anne Hammer, Carolyn Algire, Tiffany Richards, and Jay M. Baltz. Similar Effects ofOsmolarity, Glucose, and Phosphate on Cleavage past the 2-Cell Stage in Mouse Embryos from Outbred and F1 Hybrid Females.BiolReprod. 2005; 72: 1: 179- 187. Market-Velker BA, Fernandes AD, Mann MR. Side-bysidecomparison of five commercial media systems in a mouse model: suboptimal in vitro culture interferes with imprint maintenance. BiolReprod 2010; 6: 938-950. Gardner DK, Schoolcraft WB. In vitro culture of human blastocysts. In: Jansen R, Mortimer D (eds). Toward Reproductive Certainty: Fertility and Genetics Beyond 1999. UK: Parthenon Publishing London 1999; pp. 378- 388. Kovacic, B. Vlaisavljevic, V. Reljic, M. &Cizek-Sajko, M. Developmental capacity of different morphological types of day 5 human morulae and blastocysts. Reproduction Biomedicine Online 2004; 8: 687-694. Conagahn J., Handyside A.H., Winston R.M.L. &LeeseH.J. Effects of pyruvate and glucose on the development of human preimplantation embryos in vitro. Journal of Reproduction Fertility 1993; 99:87-95. Chatot C.L., Tasca R.J. &Ziomek CA. Glutamine uptake and utilization by preimplantation mouse embryos in CZB medium. Journal of Reproduction Fertility 1990; 89: 335-346.